Arbuthnot and Pals' Super Happy Silly Mega Fun Gameshow! Crazy games entertained a packed Customs House for nearly two hours. The family friendly game show format wouldn’t be out of place on peak time television. In fact, it reminded me of some classic formats in the 1970s, this was indeed an entertaining afternoon. The humour at times may be at the level of laughing at the sound of breaking wind but the kids were loving this show from the very start. The pedigree is very high. David John Hopper is an integral part of the award-winning Customs House pantomime. 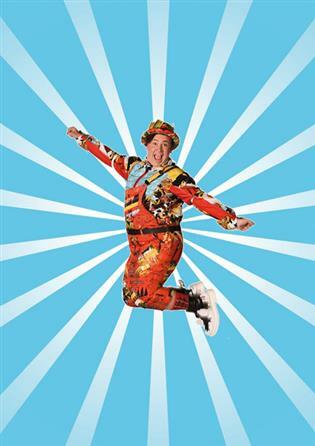 His Arbuthnot character is one of the most responsive comedy characters in the North East. He is on the same wavelength as both the younger members of the audience and the older fans too. The Arbuthnot character works well in the gameshow format. David’s ability to listen and to react to the answers given by participants is noticeable. This attribute, coupled with his ability to put contestants at ease, is reminiscent of the late great Bob Monkhouse. David makes the job of host look all too easy. It reminded of the tale of The Golden Shot, in which the TV executives thought the role looked simple and the host could be easily replaced with disastrous results. So, what happens in this show? The audience is split down the middle into the red and blue teams. Our team captains are then introduced. The red team have Charlie (Charlie Raine), whose portrayal of Cutlet the signing sheep at last year’s Customs House panto has been nominated for a Great British Pantomime Award. Ahead of the ceremony at the end of April she was full of energy – good job too as she was expected to run up to the balcony to find contestants from time to time. The blue team was led by Mac (Dale Jewitt), who was Puddles in The Lambton Worm which was given the North East Theatre Guide’s award for the most entertaining panto. Like Charlie, he was soon running up and down the venue finding contestants. The games themselves are quickly aimed at the whole age range. We have different opportunities for the primary school aged kids, the pre-teens, teens and adults. For raspberry blowing, bottle flipping, tortilla tossing and tongue twisting fun was as enjoyable to watch as it must have been to take part. The whole of the stalls had games that they could get involved in too. As the balls bounced along, I remembered some of the capers that I witnessed on It’s A Knockout. The interval was notable as the children were able to nominate their parent(s) for the gunge tank. Suddenly every child wanted to fill the forms in. The parent who was eventually selected was a very good sport. This is not a show for anyone upset by water pistols or flying toilet rolls, but it is most definitely the show for a family laugh. The team worked so hard (and I include the acrobatic “Uncle Andy” who kept score in that too). The energy in the room lasted to the end. Well done to everyone involved.